Herbs, perennial, scapose, from tunicate bulbs, with onion odor and taste. Bulbs solitary or clustered, dividing at base, or on rhizomes, reforming annually; outer coats generally brown or gray, smooth, fibrous, or with cellular reticulation (generally important in identification); inner coats membranous. 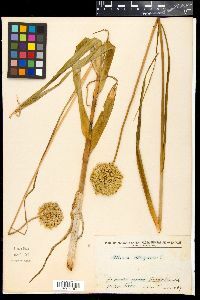 Leaves generally withering from tip by anthesis, usually persistent, 1-12, basal; blade usually linear, terete, channeled, or flat (carinate in A. sativum, A. praecox, A. tuberosum, A. rotundum, A. neapolitanum, A. triquetrum, A. unifolium, and A. lacunosum), straight or ± falcate (coiled or circinate in A. nevadense and A. atrorubens), broader in A. victorialis and A. tricoccum, not petiolate (except in A. tricoccum and A. victorialis). Scape usually persistent, terete or flattened. Inflorescences umbellate, flowering centripetally (centrifugally in A. schoenoprasum), sometimes replaced totally or partially by bulbils, subtended by spathe bracts; bracts conspicuous, ± fused, usually 3+-veined, equaling pedicel except in some introduced species, membranous. 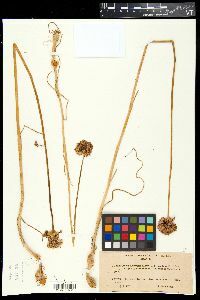 Flowers erect (pendent in A. triquetrum); tepals 6, in 2 similar whorls, ± distinct, petallike, usually becoming becoming dry and persisting; stamens 6, epipetalous; filaments in all but 1 native species broad at base, fused into ring (some introduced species and A. victorialis appendaged), linear, generally glabrous (A. rotundum and A. hoffmanii papillose to ciliate proximally); anthers and pollen variously colored; ovary superior, 3-lobed, sometimes crested with processes, 3-locular, usually 2 ovules per locule (6-8 in A. nigrum), crest processes 3 or 6, smooth except in A. haematochiton, A. sharsmithiae, and A. lacunosum; style 1; stigma capitate to ± 3-lobed; pedicel erect or spreading (lax in A. triquetrum). Fruits capsular, dehiscence loculicidal. Seeds black, obovoid, finely cellular-reticulate, cells smooth or minutely roughened, with 1-8 papillae, without caruncle except in A. triquetrum. x = 7, 8, 9. 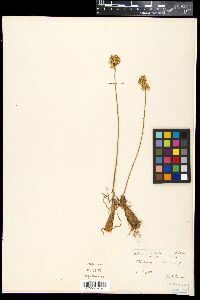 As with many other genera in the Liliaceae sensu lato, Allium has been segregated into a separate family, Alliaceae, by most recent authors (R. Dahlgren et al. 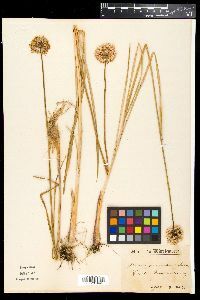 1985; K. Rahn 1998; A. L. Takhtajan 1997; R. F. Thorne 1992).Old World species of Allium are generally placed in subgenera and sections. Attempts to treat New World species similarly have gained less acceptance. H. P. Traub (1972) recognized subg. Amerallium, encompassing all of the x = 7 North American members of the genus. P. Hanelt (1992) placed the Old World x = 7 species also in that subgenus, which includes all but three of the North American species (A. schoenoprasum, A. tricoccum, and A. victorialis), which have x = 8. 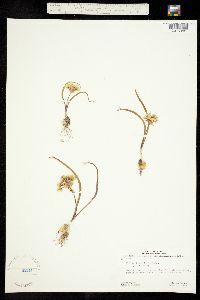 These latter species have been placed in subg. 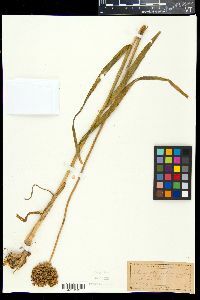 Rhizirideum (P. Hanelt 1992). Resolution of the problematic subgeneric and sectional relationships among Old and New World species will require much more extensive molecular and phylogenetic analysis of the genus. The characters used in the construction of the following key are the best that have been discovered for this purpose. Many of these are subject to sometimes rather wide variation. It is anticipated, therefore, that it can be used successfully only with considerable understanding of the natural units involved, their distribution, and comparison with descriptions and accurately named specimens. The Allium bulb consists of a series of leaf bases, some with blades, others without, surrounding an apical meristem. The leaf bases are replaced annually as the meristem forms a new (renewal) bulb. Often the meristem will branch, resulting in two or more bulbs being formed from a single parent bulb (increase bulbs). In addition several types of rhizomes are formed in Allium. In some cases (e.g., A. validum) bulbs form atop a thick, iris-like rhizome that produces new bulbs in succeeding years. In other cases (e.g., A. bolanderi, A. campanulatum, and A. unifolium) each bulb produces one or more rhizomes that in turn produce a terminal renewal or increase bulb. There is variation even in this type of rhizome. In some species (e.g., A. bolanderi and A. unifolium) the bulb producing the rhizomes disappears during the development of the rhizomes and new bulbs except for the roots, which remain active until the new bulbs mature and become dormant. 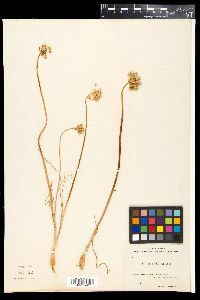 In others (e.g., A. campanulatum) the bulb produces a number of very short rhizomes around the roots, each of which develops a very small terminal bulbel. At the same time, the parent bulb remains intact and produces a renewal bulb, or may divide to produce two or more large increase bulbs. As a result, specimens with this type of rhizome will have one or more large bulbs with a number of much smaller bulbels among the roots. 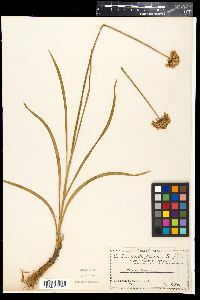 Several Old World species (Allium ampeloprasum Linnaeus, A. cepa Linnaeus, A. oleraceum Linnaeus, A. sativum Linnaeus, A. nigrum Linnaeus), grown as foodstuffs or ornamentals, may be encountered and are certainly represented in North American herbaria. For this reason, these species have been included in the key. Some do not reproduce by seeds and probably should not be considered as truly naturalized in our flora, although they may persist for long periods at or near places where they have been planted. Additionally, over 52 species contained in this treatment are considered choice garden plants and are readily available through catalogues and garden centers. Locally, these species and possibly others grown as garden plants may escape and become established. 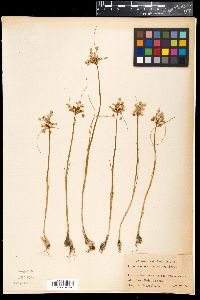 It is inevitable, therefore, that numerous specimens of these escapees will be represented in North American herbaria and may muddy the boundaries of what is regarded to be the natural distribution. We have attempted in all cases to map what we consider to be the natural ranges of these species, based on the specimens examined over the years. Material falling outside these ranges may include these escapees and should be suspect. Fls perfect; tep 6, uniform in color but often somewhat unlike in shape or size, generally withering and persistent below the fr; stamens 6, often adnate to the base of the tep, the filaments of the epipetalous series often wider, or strongly flattened, or variously toothed; anthers short, introrse; ovules 1 or 2 per locule; capsule short, ovoid to globose or obovoid, 3-lobed, loculicidal; seeds black; herbs from a coated bulb, with a strong odor of onion or garlic, the lvs usually narrow, basal or on the lower part of the stem, the scape- like stem erect, terminated by a determinate umbel subtended by 1-3 bracts; fls white to pink or purple, sometimes replaced by sessile bulblets. 500, N. Hemisphere.